My photo club held its last meeting for the spring semester last week-end. It was of course held in appropriate surroundings with lots of fun, food and festivities, and of course a bit of photography as well. Some of this I'll share with you as a symbol of the approaching summer holidays. Have a nice week-end and a nice summer! Wherever you find yourself, have a good summer. Shalom until next time. I have many colleagues in Sweden, who tend to disappear this time of year. Lucky them, that's the way to take a holiday! The clarity of the water...wow. I need to return to Norway! Have a splendid summer, Rune! One say that swans sing only once in their life , before dying. And that this song has a marvellous beauty; This wonderful picture is the swan's song of your spring blogging time: rare , beautyful , strange , unforgettable ! I wish you a happy summer! Wherever you are, whatever you are doing, enjoy to the fullest. Flott svane og strandkanten var skikkelig spesiell! What a beautiful capture, Rune!! 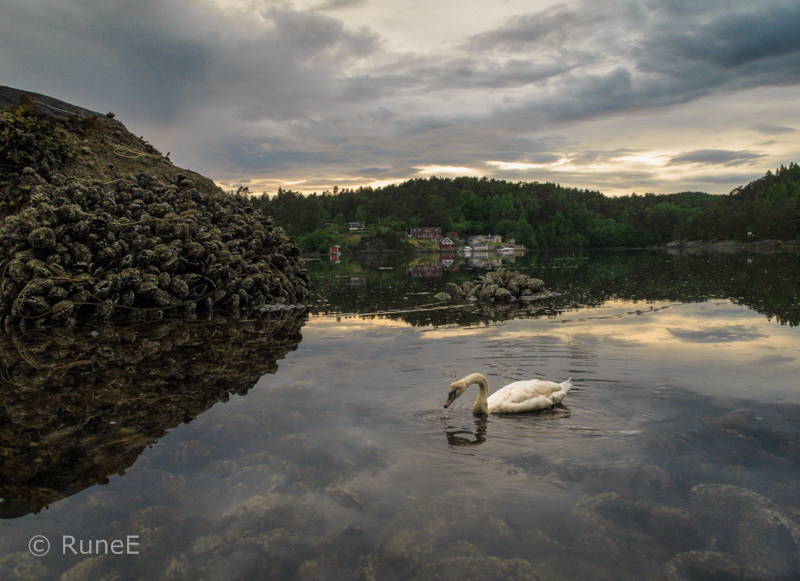 I love the swan and the wonderful reflections in the water! Such a lovely place! Wishing you a great weekend! Enjoy! beautiful! its been quite a while. gotta come by more often. This photo has such another world feel about it. Enjoy your summertime. The swan looks a bit lonely though. Et vakkert landskapsbilde med en herlig fred og ro over seg. Det varme fargeskjæret skaper følese av sommer og kveld. Veldig bra, Rune. You often find beautiful light for taking photos. an amazing photo! love the moody feel in it. Hope you post more often than you're expecting to. This shot's a fine, fine combo of landscape, reflection, clouds, and the houses. We almost don't need the swan, but I'm glad it's there. It's very Hans Christian Anderson to me in a melancholy kind of way - but I think he's a Dane. Not sure though. Uncle Google? Such a regal Lady, and a great Photo.